Half the grind, all the magic! Test your mettle on the legendary Challenge Wanaka course but at half the distance on 15 February. The course will follow the spectacular route that has quickly earned Challenge Wanaka the title of the world’s most scenic triathlon. The 1.9km swim will be one lap of the swim course in the crystal waters of Lake Wanaka, the 90km cycle will travel out towards Treble Cone before heading back through Lake Wanaka and then cutting across to Lake Hawea (see an interactive profile of the bike course below). The 21.1km run will be one lap of the current Challenge Wanaka run course, half of which is off-road alongside the lake and banks of the Clutha River. 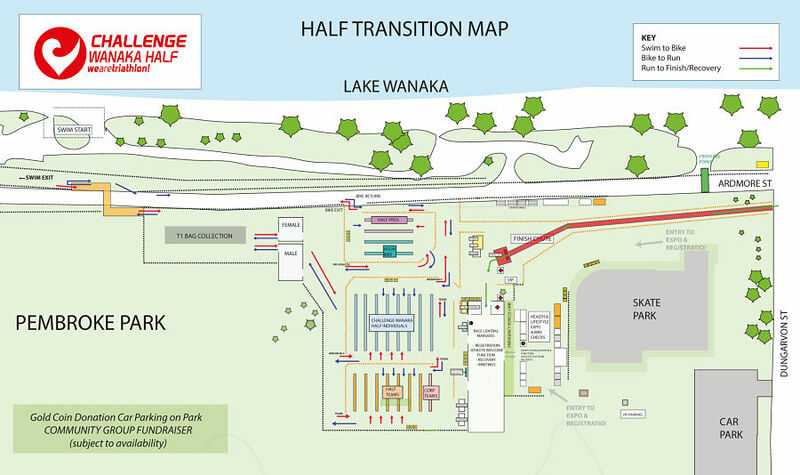 The Challenge Wanaka Half is open to both teams and individuals. 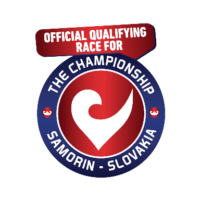 Challenge Wanaka Half is also an official qualifying race for THECHAMPIONSHIP. For more information please visit The Championship website. The 2020 race manual will be available as soon as it is updated. 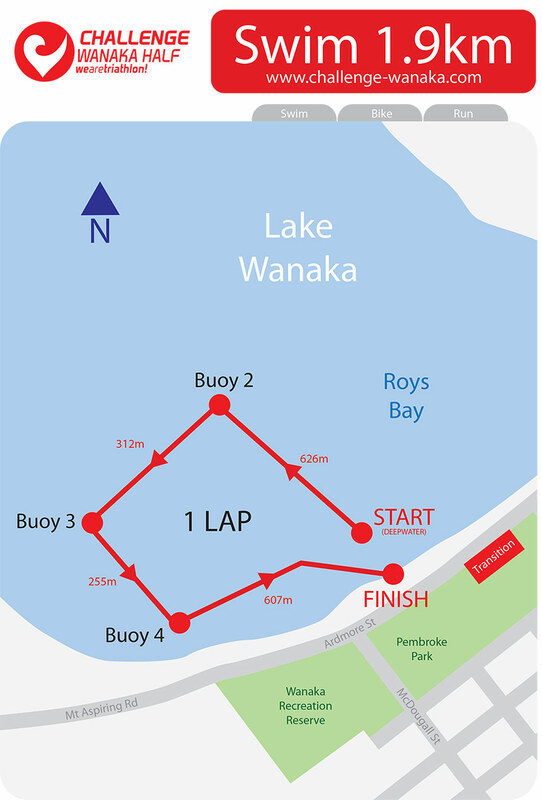 The one-lap swim is in the sheltered part of Roy’s Bay in Lake Wanaka within easy view of spectators watching from the shore. The course has a deep water start swimming in an anti-clockwise direction with a total of four turn buoys. The average water depth for most of the course is 2.5m although the second leg does have depths of up to 13m. Lake Wanaka is the warmest lake in the Southern Lakes and is a popular choice for a large range of water sports each summer. The swim course is in crystal clear water so clean you can drink it. Please note that other swim equipment (e.g. neoprene swim cap) maybe made compulsory prior to the event. Compulsory gear will be finalised by race briefing. In all likelihood, the swim course temperature in February will be in the region of 16C-18C, and that being the case, we will revise the compulsory requirements for the swim, but you must come prepared to adhere to the above. Those not wearing compulsory gear as specified by the event team on race day will not be allowed to start. There is a Swim the Course practice session on Thursday between 7.00-8.30am. This is the only time that the course will be patrolled with safety boats. If you wish to swim in the lake at any other time, you MUST wear a brightly coloured swim cap and swim in groups. It is recommended that you also have a friend in a safety kayak. This is for your own safety and that of other lake users. Also, please keep out of the water ski lanes (marked by blue/yellow striped posts on shore) and the marina area. We strongly recommend you attend the Swim the Course. It is an excellent way to acclimatise to open water swimming in a large group under the safe watch of qualified medical personnel. Lack of acclimatisation can lead to panic attacks in the water at race day and we want you to finish your race at the finish line, not the first turn buoy, after all your hard work preparing for the race! The 90km bike is over one lap and takes in two of the alpine lakes in the Southern Lakes region. The course heads out of town winding round the edge of Lake Wanaka towards Mt Aspiring National Park, reaching the Hospital Flat turnaround point at 18km and heading back to the township. 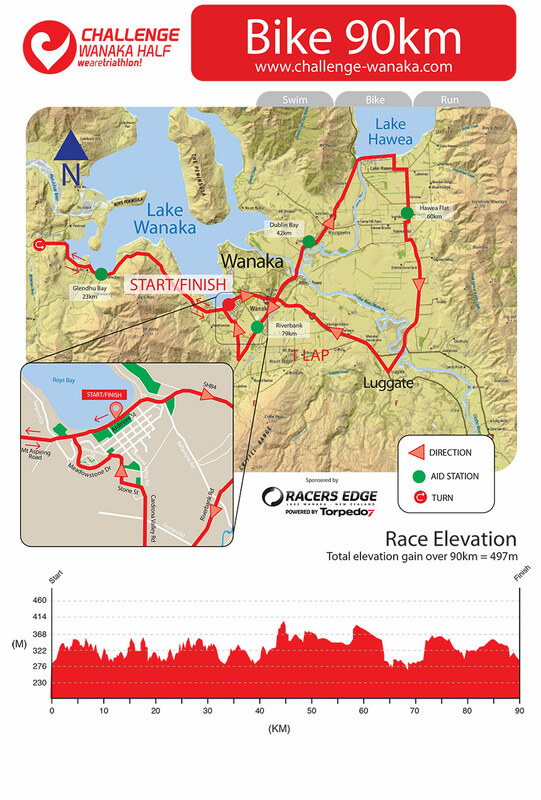 After passing through the main race area and crowds of spectators the course turns left through Albert Town and an undulating ride to Lake Hawea. After a ride along the Hawea lakefront the course heads to Hawea Flat followed by a short climb to the terraces and then a steep descent to the Clutha River across the Red Bridge. Turning right at Luggate, competitors will climb to Wanaka Airport and head back towards Wanaka taking a short detour along Riverbank Road to the Cardrona Valley Road before the final 5km downhill and back to transition. Aid stations on the bike course will be approximately 20km apart. These will have bike bottles with PURE electrolyte drink or water in them. PURE bars, PURE Gels and bananas will also be available from aid stations at all times, along with hydration from PURE. Coke is available on the final two aid stations. Please make sure you train on these products prior to the race so you know how they work for you – everyone is different. If you are caught drafting you will be penalised and/or disqualified as per the Triathlon NZ regulations. Please read the Terms & Conditions which are part of the entry form for clarification on our drafting rules. The run heads towards the Lake Wanaka Outlet Track along the lake edge and follows the Clutha River towards Albert Town. 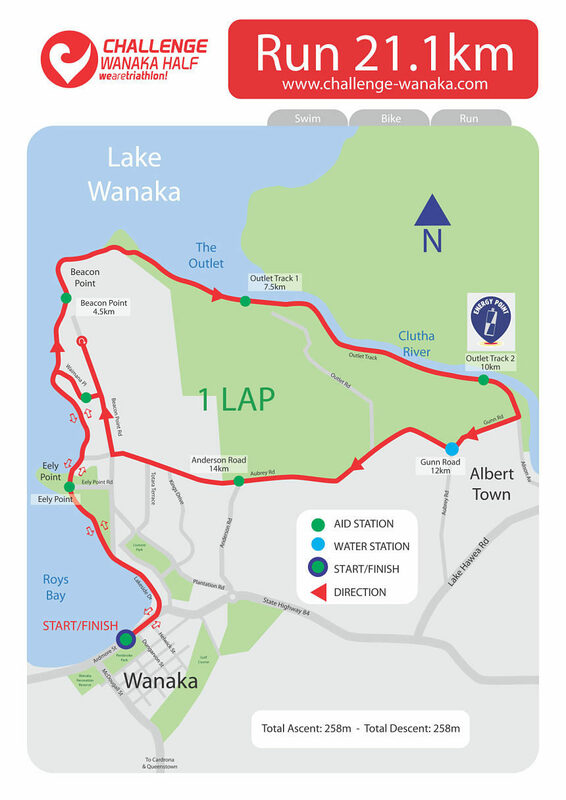 Once at Dean’s Bank (12.5km) the course turns right into Gunn Rd (sharp uphill) right into Aubrey Rd (long gentle downhill), right onto Beacon Point Road down to the turnaround at Ridgecrest, back up Beacon Point Road and turn right into Waimana Place and then left back onto the lakeside track then onto Lakeside Road towards the town centre. The run course is 25% sealed, 75% gravel and is one lap. Aid stations on the run course will be positioned approximately every 2.5km. They will be offering PURE bars, PURE Gels and bananas along with hydration from PURE, water, Coke, bananas, salty crackers and ‘jet plane’ lollies. Other foods will be available, and will vary from station to station. Sponges will also be available. Teams competing in the Challenge Wanaka Half are to be made up of 4 or 5 athletes consisting of one swimmer; one or two cyclists and two runners (any teams wanting to compete with fewer team members please contact the Race Director). If the team is made up of two cyclists the first does the Glendhu leg (36 kms) and pulls into the bike transition to change over at the bike racks. The second cyclist will then push their bike out and cycle the second section (54 kms). All teams MUST have 2 runners who will do approximately 10.5Km each. Your run changeover will be at the aid station at the Outlet Track 2. Your swim start will be with Corporate Teams. All team members should run up the finish together to receive their medals. There will only be trophies for the first 3 teams. Please note all other Challenge Wanaka Half rules apply. As you come up the finish chute, take a little time to reflect on what you have achieved, and relish the experience of finishing the Challenge Wanaka Half. Once under the finish gantry, each competitor will be assessed by the medical team and be guided through the recovery tent where a well-earned food, drink and congratulations await you! Challenge Wanaka Half Individual and Team entry includes a finisher’s shirt per person. 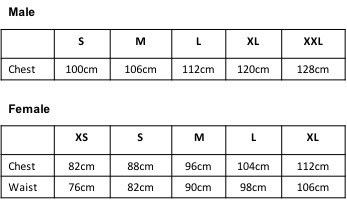 You are responsible for ordering your size according to the sizing guide below. If you wish to check or change your size you can view your registration by logging in using your confirmation number at this link (your confirmation number can be found in confirmation email). Please contact us if you wish to change your size. Course closes for individuals and teams: 4:30pm.